The Museum has a growing reputation within education as a popular destination for school visits and we are developing more and more resources to help educate younger people. Sometimes, we are asked to come along to a school to talk to younger people on a specific subject. Earlier this month, we were contacted by Sutton on Derwent Primary School and invited to talk about Remembrance. The school had a whole season of discussing the idea and importance of remembering many different things. 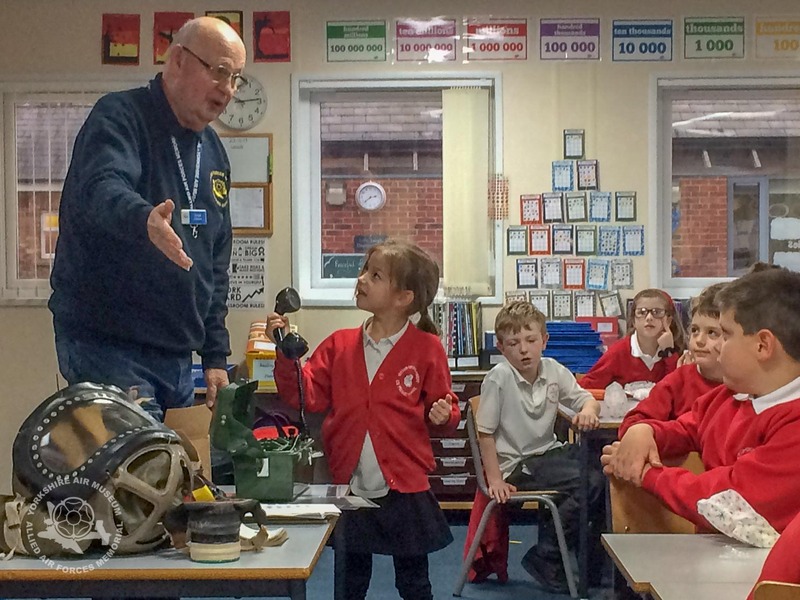 Part of the course was the subject of Remembrance, with the children particularly wishing to talk with someone who could remember World War Two. Museum guide David Coxon travelled to the school with Museum deputy director Barbara George, together with some interesting items from our archives collection. The children heard from David who was a small child in World War Two. He was able to describe first hand to the children what life was like for him in wartime to the class. We took along items that would have been commonplace in society at the time, such as gas masks for both adults and children. It was really wonderful to see how the children, aged between 7 and 9 years old, were really engaged, asked a great many questions as you would expect and David was kept extremely busy. The Museum now has a complete team of knowledgeable guides able to present a variety of subjects that are relevant to educational standards of today. In addition to their work with normal Museum visitors they are really enjoying respondling to requests like the one from Sutton Derwent Primary School. We took away from the day some happy memories of our own.